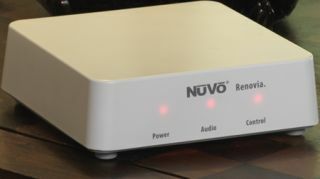 CEDIA SHOW 2011: NuVo Technologies introduces Renovia powerline multiroom system | What Hi-Fi? Star of the NuVo Technologies stand here at CEDIA 2011 is the Renovia multiroom audio system (above) which uses HomePlug powerline (PLC) technology to distribute audio to different rooms in the home. It has a centralised hub and then 50W zone amplifiers for each listening area, connected via your home’s electrical wiring system. Each zone amp has built-in 2 x 20W amplification. The Renovia can handle six sources across up to eight zones, and play four sources simultaneously including internet radio and Spotify (if you have a subscription). An AM/FM radio is included in the main hub, and a twin output DAB tuner is optional, as are iPod or iPad docking stations and in-wall touchpad controllers. Alternatively, the entire system can be controlled using an iPod/iPad app. Prices start at £1614 for the control hub, £474 for each zone amplifier, £2994 for the main server and £59 for the iPod/iPad control app. Also new from NuVo is the Music Port Elite MPS4-E streaming device (below). It can store, organise and distribute PC-based audio content, while also streaming internet radio stations. A ‘cloud synchronisation’ feature allows users to access their music libraries from multiple locations. Content can also be streamed from NAS (network attached storage) devices. The NuVo MPS4-E caters for up to four simultaneous sources and has 640GB of internal storage. It can handle PC audio files, either in Windows Media Player or iTunes, while also streaming audio from a variety of online services. NuVo products are distributed in the UK by Habitech.